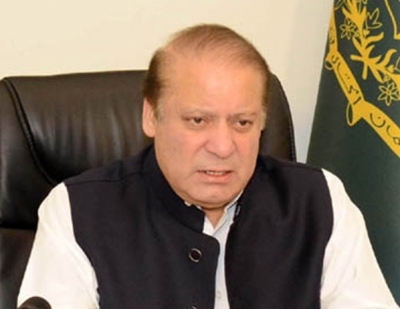 Islamabad July 14 (IANS) The trial of two remaining National Accountability Bureau (NAB) cases against former Pakistan Prime Minister Nawaz Sharif and his family will take place in Rawalpindi s Adiala Jail according to a notification issued by the Ministry of Law and Justice. "The federal government is please to specify the Central Jail Adiala Rawalpindi to be the place where the Accountability Court-I Islamabad shall sit for trial of References No. 18/2017 and 19/2017 against Nawaz Sharif and others " the notification stated on late Friday. An accountability court convicted Sharif his daughter Maryam Nawaz and son-in-law Captain (retd) Mohammad Safdar Awan on July 6 in the Avenfield properties reference. They were given jail terms of 10 years seven years and one-year respectively reports Geo News. Sharif s sons Hassan and Hussain have been absconding and were declared "proclaimed offenders" in the case. After the court s verdict the remaining cases pertain to the Al-Azizia Steel Mills and Hill Metal Establishment and offshore companies including Flagship Investment Limited. A notification issued by the Islamabad administration declared the rest house at the Sihala Police Training College in the capital as a sub-jail to keep the two leaders with immediate effect and until further orders. Sources then told Geo News that that only Maryam Nawaz would be moved to the rest house. However later sources claimed that the authorities decided to keep the two at Adiala Jail. The trial against the Sharif family had commenced on September 14 2017. Nawaz and his sons are accused in all three graft references whereas Maryam Nawaz and Safdar were accused in the Avenfield reference only. The two brothers based abroad had been absconding since the proceedings began last year and were declared proclaimed offenders by the court.